총통은 불씨를 손으로 점화·발사하는 화포(火砲)이다. 천(天)자는 천자문의 첫 자로 만든 순서를 표시하는 기호이다. 총 길이 1.31m, 통신 길이 1.16m, 포구 지름 12.8㎝로써 포 입구 띠를 제외한 마디는 모두 8개이다. 총신 포구 쪽에는 탄약을 장전하는 약실을 향하여 가로로 ‘가정을묘시월천사백구십삼근십냥장양내요동(嘉靖乙卯十月天四百九十三斤十兩匠梁內了同)’이라는 글이 음각 되어 있어, 조선 명종 10년(1555)에 만들었음을 알 수 있다. 이 총통은 우리나라 화포 중 가장 큰 화기일 뿐 아니라, 그 명문이 남아 있는 가장 오래된 것으로 국방 과학기술 문화재로 평가되고 있다. Chongtong is a cannon ignited by hand. 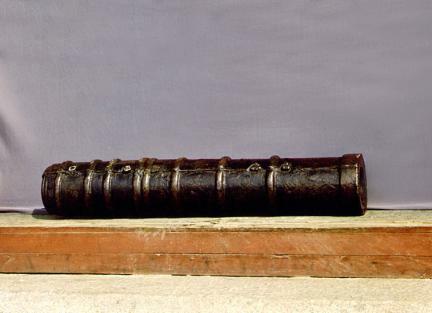 The total length of the gun is 1.31m, while its barrel is 1.16m long and the diameter of the muzzle is 12.8 cm. It has eight banded joints in its body. There is a long Chinese phrase engraved on the side of barrel horizontally from the muzzle and toward the ammunition chamber. The phrase states that the gun was manufactured in the 10th year of the reign of King Myeongjong of the Joseon Dynasty (1555). Designated as a National Treasure in 1978, this gun is one of the biggest firearms made in this country and the oldest one with such a statement engraved. It is valued as an important cultural asset in the area of defense technology.